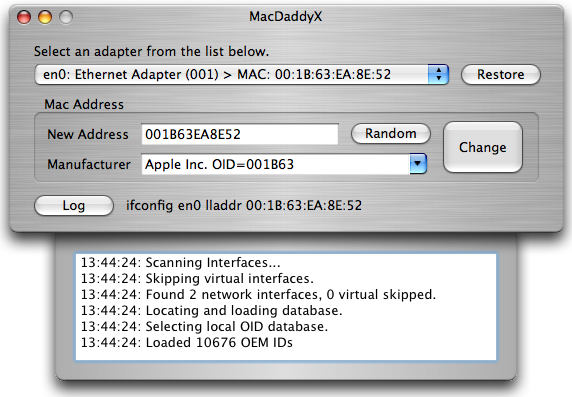 MacDaddyX is a powerful, yet easy to use MAC Address Changer (Spoofer). MacDaddyX does not change the hardware burned-in MAC addresses. MacDaddyX changes the “software based” MAC addresses. Allows changes to any NIC that permits using built-in utilities. *Fixed code for faster start-up. *Change button disabled on same MAC. +Original MAC shown on NIC list on mouse over. +Shortcut key added for Log window. -Restore button removed from preferences. *Interface window switched to metal style look. *MAC restore on reboot code redone. Advanced Options moved to preferences panel. Recover button moved to preferences. Added ability to make custom command line. Added check to see if MAC was changed. Lots of little Code Cleanups. * MacDaddyX is a front end for built-in utilities. * MacDaddyX was inspired by: Gorlani, Mac Makeup IS NOT related to MacDaddyX it is from another author. ho can one download MacDaddyX in an iphone 5? MacDaddyX is just for OSX at this time. Does it work on Sierra? Can try think works for some.